The amount of trade conducted electronically has grown amazingly since the spread of the Internet. zecommerce is an e-Commerce System which enables you to sell your products and services online. It allows you to build an online 24hrs store with fully automated mechanisms for managing your stock, your orders and transactions quickly and above all securely. You can actually start increasing your sales as soon as your electronic shop goes online. If you wish to set up an online store to sell your products and services we have the solution for you with our easy to use zecommerce product. 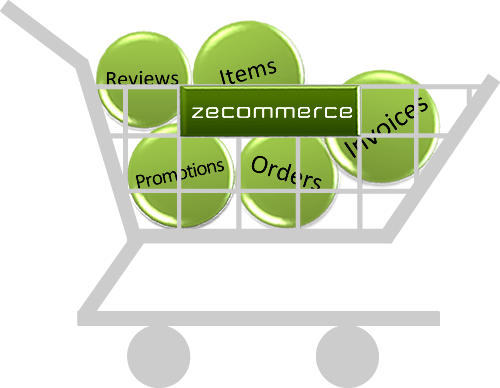 zecommerce is a user friendly system designed to be used by both non technical users, as well as IT professionals. In order to have access to zecommerce, only a web browser is required so as to login through the zeportal management console. Navigation is performed very easily through a tree based menu which follows the design of other popular applications. Products and their categories are easily managed. Additionally, a customizable number of product characteristics can be used for enriching the content and making the products filtering possible through the search functionality. Multilingual support is also provided in a simple and flexible way, aiming to target customers from different geographical regions. zecommerce provides a large variety of functionalities such as the issue of invoices and receipts, payment transactions through well established gateways, creation of products with a dynamic list of special features, creation of discount vouchers, orders and many more. Further to the provided functionalities, the modular design of zecommerce allows customization and can be tailored to your specific needs. zecommerce offers high levels of security both at IP and users’ layers. More specifically, the application can perform a check of the source IP address of the user and if valid then the login page will appear. In order to log into the system, the users must enter the appropriate credentials and only if correct, access will be granted. zecommerce also allows customers to add items in a shopping cart and their payment transactions are performed with high levels of security including encryption. Another important feature included in zecommerce, is related to users management. The system supports the creation of various user groups / roles which can be assigned certain permissions, controlling with this way the actions to be performed. When the user logs into the system, date and time are recorded, allowing the administrator to audit the various actions taken. Any operations related to adding or updating products / services are recorded accordingly. zecommerce is fully managed through ze portal management console allowing integration with zecustomer (customer relationship management system) and zecontent (content management system). Finally, the application provides endless customization capabilities through the supported integration with other web based applications using XML. zecommerce can also be integrated with ERP systems offering the possibility to send and receive data as needed. For further information on zecommerce or for arranging an appointment with our consultants please call at +357 22028128 or send an email at info@zebrac.com.